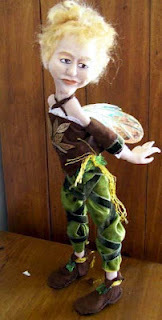 The Fairies of Farholt characters wear costumes that are quite easy to recreate with existing clothes, offcuts and a bit of ingenuity. Here are some suggestions for costumes, props and crafts. Here is a vector of Clovie's dress. It is similar to a pirate shirt in style but just about any long white shirt or blouse with buttoned sleeves would do. The waist could be formed with elastic or a thin belt. 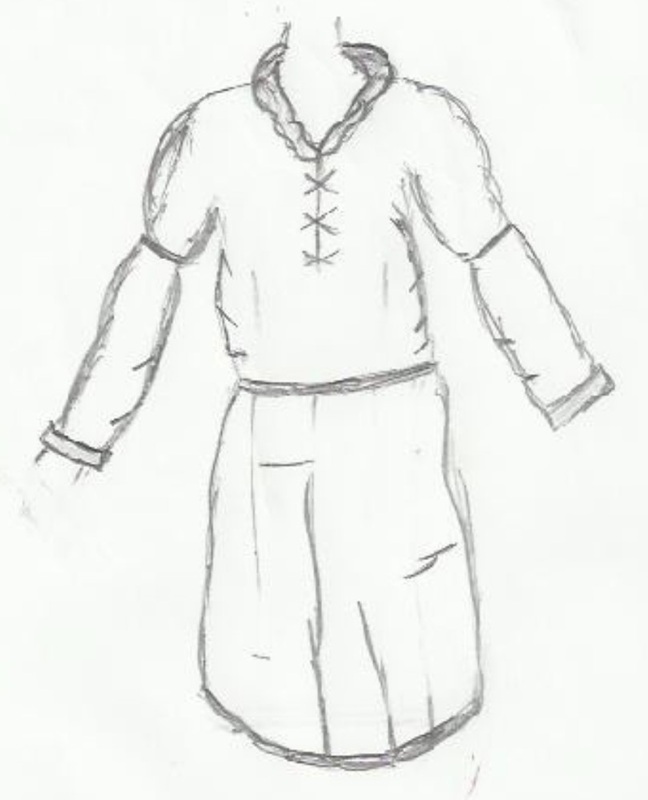 Here is a sketch of the costume, and below is a rough pattern showing how it could be created from white cotton or jersey. Clovie's sandals lace up her legs, so Roman sandals would do, or ordinary leather sandals could have elastic or shoelace straps added. Her green wings could be purchased from a fairy supplies shop, or suggested by green chiffon scarves tacked to the back of the dress and looped. 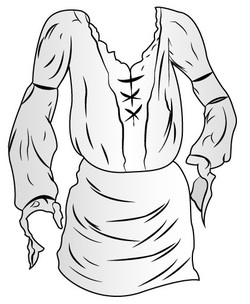 The Cromach needs a wig and beard. These can be found in novelty shops. His costume could be suggested by fawn or beige jeans or track pants with dark ribbon tacked around the lower legs. His shirt is a long-sleeved "grandpa" style shirt, with ribbon around the sleeves. He wears a belt, brown slippers or shoes and a brown vest or sleeveless cardigan. His staff is almost as tall as he is. Mairi has red slippers and a plain long black dress with long sleeves. (A long skirt and blouse would do, but charity shops often have dress-up clothes for a few dollars.) She wears a marigold-coloured shawl or scarf around her shoulders. A few sequins or bright beads could be sewed or glued on for sparkle. Moll wears a leotard or singlet top in a dark colour. The rest of her costume is mainly long tatters of dark cloth. Crepe paper or strips cut from dark green garbage bags would work. The skirt could also be made from raffia. 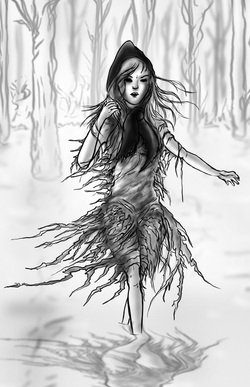 She wears a dark hood or scarf/shawl on her head. 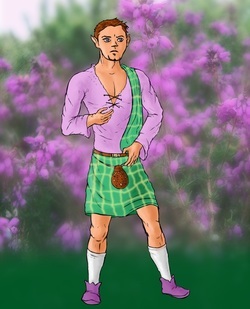 The Heatherghillie wears a short kilt in green and white. Any similar plaid skirt would do. He has a plaid or scarf in a similar colour over his shoulder. This could be tucked into the belt or pinned to the kilt or shirt., His purple shirt is similar in form to Clovie's. He wears long white socks and purple boots or slippers, and a leather pouch or sporran around his waist. The Lochladdie is easily dressed in tight dark trackpants or footless tights and a dark, close-fitting tee-shirt. He can be barefoot, or wear sandals or boots. 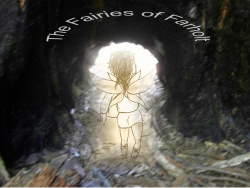 The Fairies of Farholt series has plenty of provision for imaginative crafts and project work. Below are just a few of the projects children might enjoy. The Florafae live in a village of low, rustic huts with slate roofs. These could be made from painted cardboard, or from wood or clay and arranged around a green cloth to represent the village green. Put the Great Cairn in the middle of the green. Draw or paint the flowers and plants mentioned in the story. Write a little about them. 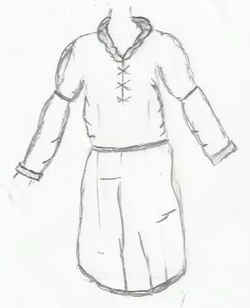 Design costumes for some of the minor characters. Some of the plants such as trefoil, clover, and marigolds are easy to grow in pots. Plant your own Florafae pot garden. You could add other flowers such as polyanthus, pansies, violets, and daisies, ferns and fancy grasses. The Tussie is a made-up animal in Clovie Trefoil. What other animals might live in the Lands? invent your own animal or bird. Draw or paint it and write a description. There is no picture of the Tussie in Clovie Trefoil. 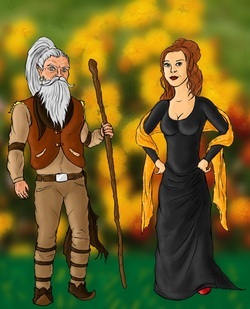 Read the description in the story and draw or paint a picture. 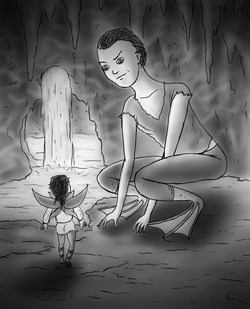 Make a scrapbook and draw some of the characters and places in the stories. Cut out pictures of flowers, ferns, nuts and berries, or any houses or furniture you think would fit the Fairies of Farholt world. You could add pictures of frogs, butterflies, birds and other small creatures. The Cauld One of Carn looks like a dragon. Imagine what other dragon-like creatures might live in the Lands. Draw or paint your dragon, or model it from clay or plasticine. Decorate it by glueing on beads, sequins, stickers, feathers or scraps of foil or coloured paper. or plasticine, or use a plain fashion doll (or "blank") as the base. Peg dolls could also be used. them in sand would help with stability. Each layer should be made from slightly smaller stones until the single capstone goes on the top. 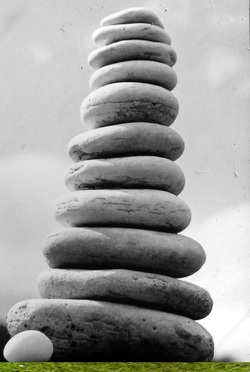 The cairn could also be made from plasticine or even pingpong balls painted and glued together.